Many homeowners love do-it-yourself home projects, but are the products we use such as paint and wallpaper, non-toxic and safe? We all want our homes to be free of cancer-causing toxins, especially when it comes to the decor we choose. Not only is it important for adults, it is critical to use sustainable and green products around any area where children and pets play. Do we really want to decorate a nursery room or a recreation room with potentially toxic substances? I think not. But, how do you choose the right kind of non-toxic paint and wallpaper? Fortunately we can now buy paints that low in or free of VOCs, or volatile organic compounds. This is so important because the paints that do contain VOCs still release toxins years after they have dried. One hasty decision at the home improvement store can have very long lasting effects. 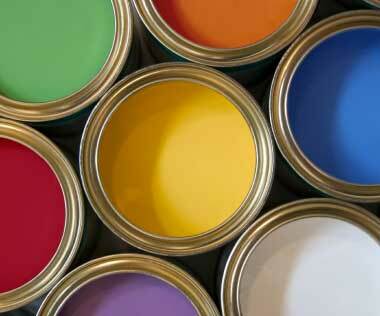 Non-toxic paints have significantly less odor that can spark allergic reactions, headaches and, nausea. Make sure you are buying paint that is low on the VOCs or free of VOCs entirely. Do this by reading the labels or asking your paint retailer. I have used C2 LoVo myself with wonderful results. The paint fume smell was non-existent. I was a very happy, green customer. For paint, visit a local paint retailer and ask if they have any paint products that are fungicide free, are low in biocides, have natural pigments and, have less than one VOC level per pint. Other paints available that are green and considered sustainable are “milk” paints. These paints require you add water and provide an eggshell like finish. Milk paints are free of petrochemicals, solvents, additives, and lead. I also found wood sealers that are made of natural vegetable oils and waxes allowing your wood to breathe. These wood sealers are also water repellent, last a lifetime, and can be used on concrete floors. For paint and stain clean-ups, look for products that are citrus-based to stay away from toxins. Wallpaper can be trickier, not because it isn’t commercially available but because it is so expensive. I have seen non-toxic wallpaper sell for over $100 a yard! For a wallpaper twist, natural bamboo lined with muslin treatments are unique and can be hung with non-toxic paste. These bamboo wallpapers can come in many designs depending on their cut and the recycle process and can be hung either horizontally or vertically. Beyond bamboo, if you have the artistic touch, you can recycle many things for wall coverings and use non-toxic wallpaper pastes. Recycled wallpaper, made of recycled products like facial tissues, toilet paper, napkins and, writing and office papers. These are then turned into quality wallpaper you can be proud to hang on your walls because of the recycling process—go totally green here! If you don’t have the artistic touch, look for wallpaper that is made out of Kirei or Sisal. Kirei is made from the stalks of the Sorghum plant and Sisal coverings are made using natural fibers. Other natural wood wallpaper and wall coverings are popping up everywhere and we even found some natural Juniper wallpaper. To remove paints and wallpaper when you are ready to start your green renovation, remember to find paint and wallpaper removal products that are non-toxic. Most of these are water-based so ask your paint or wall-covering retailer which are the best ones that contain no toxins. There are many ways to color your walls green so to speak if you do some research. If you can’t find products where you live, do an online search—there are many companies that have products geared toward the green homeowner. So the next time you’re ready for a home project, use your imagination, and see how many products you can use that are recycled, unique, and free of toxins and additives. Your family deserves it! Non-toxic paints: C2 LoVo and Mythic Paint. So, if you want to paint the walls in an old house, how do you get the old paint off the walls to begin with? Do you need to? Can you green-strip textured paint? We are going to be moving soon so I’ve been looking for some “green” ideas when it comes to paint as we’ll need to re-paint our new house. Thanks for the suggestions. So I see all this great stuff about non toxic and VOC free paints. I wanted to share my find. I make all kids of furniture and children’s toys and I have found a one stop shop company for all the finishes I need for my projects, they even have wall paint that I painted my child’s room and my living room with. They are Earth Safe Finishes (www.earthsafefinishes.com) and the part I love most is that in addition to being non toxic and VOC Free, all their products are made in the USA and they are so high quality. When I painted my walls, one coat was all I needed. I find myself looking for stuff to paint just to use all their products. I just redid my sons room using a WONDERFUL paint, YOLO Colorhouse. We used a great blue, Water .05..it was the PERFECT color for a boat themed room!